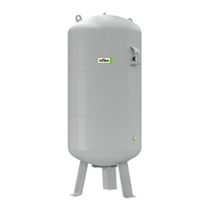 Reflex diaphragm expansion vessels are available in different pressure ranges and nominal volumes, either flat or cylindrical, depending on the application, and with a fixed diaphragm or replaceable bladder. Reflex N are the world's most frequently used small vessels. 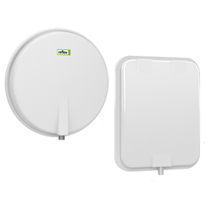 The fixed diaphragm has proved itself millions of times over and has shown itself to be extremely wear-resistant, thanks to its evenly-balanced loading. 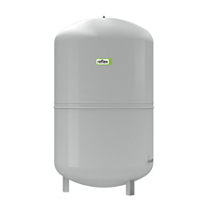 Designed as the specialist expansion vessel for solar systems, the series S has been designed especially for the addition of up to 50% anti-freeze and pressures of up to 10 bar, making it ideal for use with heating and cooling systems. Our Reflex SL product line is the perfect choice for limited spaces through compact, space saving and slim construction. For closed heating and cooling systems with threaded connections. 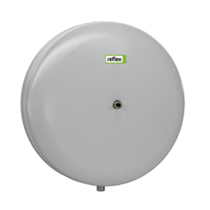 The further developed, high-performance Reflex C incorporates many practical benefits: The flat cylindrical housing with integral hanging bracket allows space-saving, fast wall installation. The bladder is made of butyl. 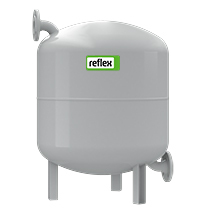 Identical in contruction with Reflex N, except the replaceable bladder in the Reflex G meets all the requirements for possible repeated inspections needed with larger vessels. 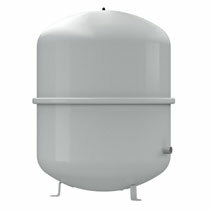 The space-saving Reflex F is the ideal unit for use with every wall-mounted boiler. Reflex also offers tailored solutions alongside the standard range outlined in the following section. Intermediary holding vessels protect the diaphragm in diaphragm expansion vessels from overtemperature and condensation in the compression chamber at systemic media temperatures between >70°C and <4°C.